God by grace resides in the just soul as in a temple, in a most intimate and peculiar manner. From this proceeds that union of affection by which the soul adheres most closely to God, more so than the friend is united to his most loving and beloved friend, and enjoys God in all fullness and sweetness. For you have died and your life is hidden with Christ in God. When Christ, your life, shall appear, then you too shall appear with Him in glory. Christian adoration or silent prayer is the only act of our spiritual life that does not depend on any sort of quality to bring about in us our growth in holiness — our growth in Beatitude. Silent prayer is the work of the Holy Spirit within us. The Holy Spirit, who is the life of the soul, brings about in us a filial communion. He does this by means of the theological virtues: Faith, Hope, and Charity. It is significant that we name these virtues. A virtue is a source of action — a source of work in us. It is a habit. Courage is that virtue which makes possible works undertaken in danger. But if to be a virtue is to be a source of action springing up from the depths of the human soul, then what could it mean that we add the word theological? The modifier, theological, refers to the end toward which these virtues lead. And this is end is God Himself; and our friendship with Him and the Blessed. Adoration is the work that is brought about by the exercise of the theological virtues. Faith, Hope, and Charity make possible the prayer of Christian adoration. This adoration is the act of an intelligence illumined by Faith; of a will strengthened by Hope, in a soul enflamed by the fire of Christ’s Love. Christian adoration is the Divine exercise of the theological virtues. We say Divine exercise because this is opposed to a merely prudential exercise of these same virtues. The theological virtues are the Divine exercise of a supernatural faculty infused in the human soul by the indwelling of the Blessed Trinity — God, Creator of Heaven and Earth. This indwelling is attributed most to the Holy Spirit. Christian adoration is the work of the Holy Spirit within us. By the indwelling of the Blessed Trinity in the souls of the just, God becomes the very life of the soul. And just as a courageous man comes alive — he is actuated — when facing danger; so we who have received a share in the Divine nature are actuated when we exercise the theological virtues. It is by means of adoration that man comes into God’s presence and gains a practical knowledge of the goodness and sovereign majesty of God. God loved us first. You have not chosen me: but I have chosen you. (John 15:16) In the silence of the Eucharist God gives Himself to us. This is a life lived in the obscurity of Faith but in the same love of the Beatific Vision. It is this love, which is the finality of Faith and Hope. In Charity, Beatitude is already begun. This fire of Divine love enlightens our intelligence and warms our heart. This is the secret of the Father’s heart. We are called to a shared work — a shared life. But I have called you friends; for all that I have heard from my Father I have made known to you. (John 15:15) We are moved by this life from within. This hidden life is our true life. It is our source as children of God, sons of the Father. We are sons in the Son. We must allow ourselves to be drawn into Christ’s presence under the breath of the Holy Spirit; being brought to rest in the Blessed Sacrament by His Spirit. 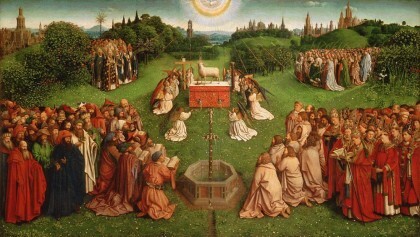 All Christian prayer is ordered to this filial communion with God and all the Blessed of Heaven. As we begin this great season of preparation, let us draw near to the Lord through the silent prayer of adoration. If it has been some time since we have made a holy hour or a holy forty-five minutes or even a holy half-hour, let us not wait. Run to Him; He thirsts for you.